It’s been quite a week. First of all I had two days at home looking after my sick little boy. Then on Wednesday I went into Manchester to have a supervision meeting. I spent most of the day reading and managed to catch up with a few of my friends, which was nice because I hadn’t seen them for a long while. The supervision meeting was very productive, with both my main supervisors setting me completely different pieces of work and discussing the work that I wrote on the Cromwell ballad flyting. I was surprised about how positive they were about that. It was barely even a first draft and I thought it was pretty rubbish, especially in terms of its flow. However, I am very pleased by the detailed feedback I was given and its certainly given me something to think about when I go back to it. But that will be a little while off. I have to re-write my chapter plan, again, with some different case studies, and I have 2000 words to write on reception theory, speech act theory and knowingnesss. So that’s what I spent yesterday reading up on. I’d done some work on speech act theory before, so I started with reception theory and wrote a bit on that yesterday. I have to say it’s been rather hard work, and I’m not entirely convinced by it all. Theory is all very well, but when it meets practice it seems to collapse… Oh well, it remains to be seen how it comes out in the wash. I picked up some more texts in the library today, so that’s Monday and Tuesday sorted at the very least! Today I was on a three hour course on ‘Evidencing Your Skills’, all about how to match your experience to competencies required by employers. It was rather too long, I have to say, but it was a useful reminder of how to prepare for life beyond the PhD! So I’ve set myself several targets from that, too. The first is to contact the careers service at the university, as there are a few options I’d like to discuss. I am also going to force myself to write some proposals for conference papers, as I haven’t done that yet at all. Having made some very clear plans for my work this week, they were scuppered by my youngest who was up all night on Sunday being sick. He’s been off school for two days, so in the two days I’ve had so far this week, I’ve read 7 ballads and tinkered with my chapter plan, and that’s it. And that’s fine. Because that was why I was working from home – so that I could look after my children. So instead of working, I spent two days guilt-free snuggled up on the sofa with my ‘baby’, making sure he recovered. Tomorrow he’s back at school, so it’s back to work for me. Unless, of course, one of the others comes down with it! Yesterday it was my great pleasure to give my first talk to a branch of the Historical Association in Manchester. 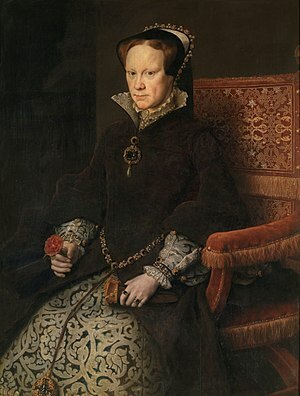 Called ‘No Lion Wilde, a Lion Tame – Popular Depictions of Mary I’, it was based the research I did for my first chapter on the ballads of the reign of Mary Tudor. The audience seemed to enjoy it, and I thoroughly enjoyed the discussion it provoled at the end of the lecture. What surprised me really was how much my ideas about Mary have developed since I wrote the chapter – there are a few things that I’d now like to change a bit, but we’ll have to see! I must think about doing some more talks, perhaps for the H.A. but also for conferences. I’ve spent a considerable proportion of the week splurging my second chapter. Second only in the sense of the second one that I’ve written, not that it will necessarily be the second one in the thesis. It feels good to have a bit more of it on paper, even if it isn’t really even a first draft. It needs a lot of work, but as my supervisor wanted to see what I was up to I sent it to him and he’s made some very helpful comments about the style and raised some interesting points about the ideas. I’m really looking forward to talking it over at greater length when I see him. It will need a lot of tidying up before it’s ready for my next panel meeting, but I’m very pleased that there is some potential in it at least. Considering that there are more than 13000 words, that’s rather a relief. My plan for this week is to revise my chapter plan and then finish off my ballad spreadsheet so that when I go in to the university campus I can ask print services to do a couple of copies for me. It’s going to be rather large! Then later in the week I will go back to the chapter and try to sort it out a bit. You may by now have noticed that I like my garden birds. I have just been standing out in the garden, which backs on to a playing field and beyond that, the countryside, admiring all the stars and appreciating the song of the male tawny owl that lives nearby. 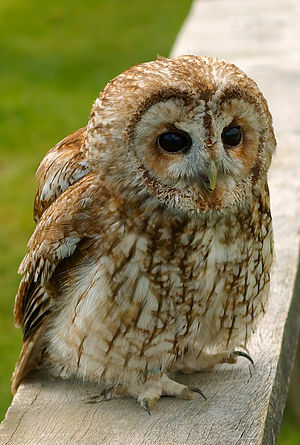 I’ve never seen it, but I’ve just compared it with my CD of bird songs and I think it’s a male tawny owl! And he’s definitely singing, not calling. There was a very good view of the stars, and I could see most of the Pleiades, which we could never see in Manchester. I’ve managed not to do any work so far today, but last night I completed another draft of my talk for the Historical Association in Manchester next week, so I suppose that one of tonight’s jobs had better be to practice it. I did spend quite a lot of time this afternoon sorting out my Bolton Historical Association business. We’re having to change hall next season, and we have a big event in the pipeline which I’m not going to reveal until it’s safely organised. But it’s also the time of year when I start trying to put together next year’s programme. I have several names up my sleeve, but I’m trying to organise something aimed at the 6th form curriculum for October before I do anything else. I’ve also been writing, a lot. By today I’d reached about 9000 words, and I’m quite pleased, but I’ve not finished my analysis of this set of ballads yet. Of course, it will need a lot of knocking into shape and revision, because it is a stream of thought at the moment. And so a new year begins. I have spent a lot of it so far cataloguing ballads, to the extent that my analysis spreadsheet is now so enormous that I am probably going to have to take it to the university print services department to get it printed out – I guess it will be bigger than a research poster and will cost me a small fortune! Especially as I’ll probably have to get two copies of it so that I can give one to my supervisor. I have, however, identified a nice section of wall in my study where I can stick it up. Actually, it’s the only section of wall that’s big enough! Still, I’ve got to finish it first, and although it’s getting there, everytime I look at anything I find more ballads that I need to add in. There are just so many it’s amazing. I have to say that after several days concentratedly staring at little boxes on a computer screen and tiny print on paper, I was heartily sick of ballad analysis and ready to give it a break, so I did. 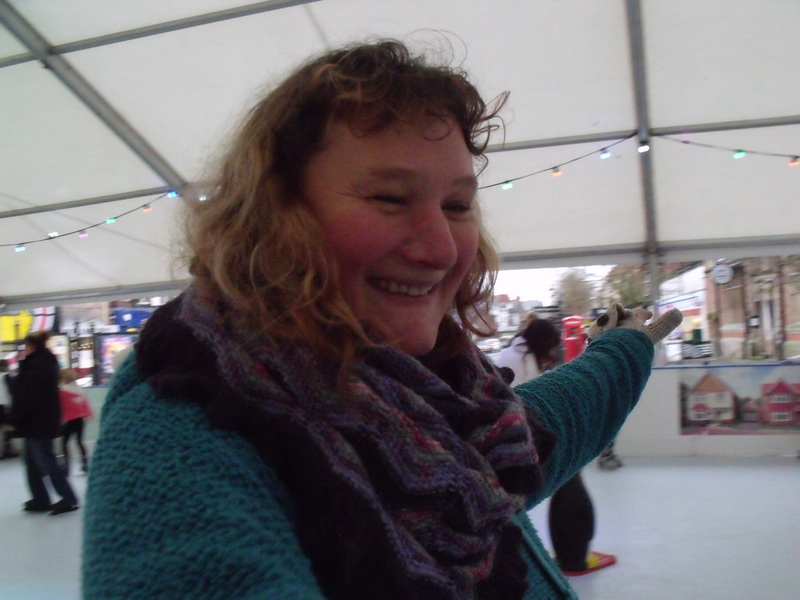 I went ice skating in Lytham with my children and had a whale of a time. I didn’t fall over once, so I was very pleased with myself. 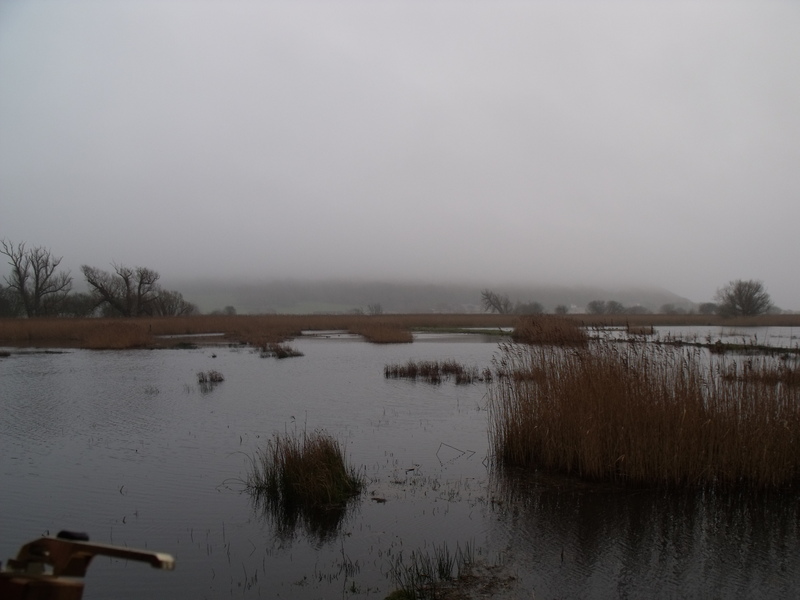 The next morning I spent doing more analysis and a LOT of filing, and then went up to Leighton Moss RSPB reserve with the family, which was very wet, but I saw several snipe, which was nice. The weather wasn’t, it has to be said, as you can see from the photograph. The snipe, which you can’t see on the photograph, were on the diagonal strip of land across the middle right. I like snipe. You’d think that something so stripy would stand out like a sore thumb, but it’s actually really good camouflage. From the new Tim Jackson hide at Leighton Moss in the rain. I spent an evening working on my talk for the Historical Association in Manchester, and I need to spend a bit more time on it. 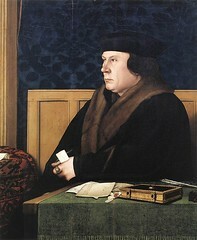 It’s called ‘No Lion Wilde: Popular Depictions of Mary I’ and obviously it focuses on the ballads of the reign of Mary. I’m quite looking forward to giving a talk to the H.A. It’s not quite the same as one aimed directly at 6th formers, and although I gave a fairly intellectually-heavy seminar for the postgrads at university, that was only 20 minutes long – not a full 50 minutes. So although it’s a bit scary, it’s fun. I’m adapting the 6th form talk I gave in November to have longer excerpts of the ballads, as they, after all, are the crucial bits. Other than that, it would involve putting in more theory, and I don’t think that’s all that appropriate. I need to make it interesting but appreciable by a general audience. The great thing about the Historical Association, though, is that although the audience is of the general public, they are assumed to want high quality, challenging lectures! I suppose it’s the questions that are the really scary bit, as I can’t prepare for them. I was instructed by my supervisor to get back into writing as soon as I could, and so far this is something I haven’t managed to do. Instead, I generated a massive amount of ballad analysis by printing an awful lot of stuff from EEBO. So much stuff, in fact, that I went through an entire printer cartridge in one day. Then I had to read it. Then I had to file it. The trouble is that I know that there are several things that I am missing: I haven’t read most of the Churchyard/Camel ballad flyting, and I know that I haven’t even printed several of the ballads I photographed at the Society for Antiquaries when I visited them last November. I did, however, finally get on with ordering copies of a lot of things I saw at the British Library, so as I’d been putting that off I’m quite pleased with myself. What else have I done? I put several ballad tunes onto Sibelius so that I can listen to them and it makes the process of analysing them, in due course, easier. They are now in a folder of their own, with copies of the lyrics that go with them. I’ve read through Cheap Print and Popular Piety again too. My plan is that next week, when the children go back to school, I will go back to my piece on the Cromwell flyting of 1540 and finish a draft of that. It’s something to look forward to. I’m going to give the rest of the missing ballads a break for a few days while I get stuck into writing again. Should be fun.